But a few iterations of Wells didn’t make the final cut. “Unfortunately, one of the casualties was Wells the Gray, who was a Gandalf guy basically throwing out non-sequiturs,” Cavanagh shared. Also on the cutting room floor: “I think it’s unfortunate the Russian didn’t see the light of day” — for now. But don’t be surprised if some of the castoffs, like Wells the Gray, show up down the line. “In Season 17, when I really will be gray,” the actor quipped. 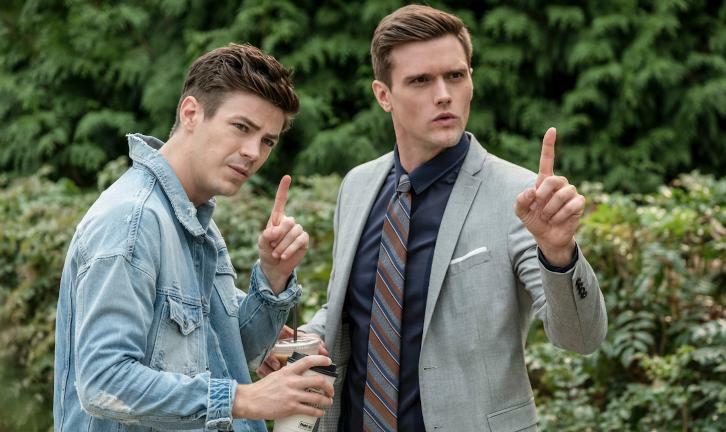 ONE HARRY, TWO HARRYS, THREE HARRYS, FOUR — When collectors of Native American artifacts are attacked by a meta named Mina Chayton (guest star Chelsea Kurtz) who can bring inanimate objects to life, Barry (Grant Gustin) turns to a surprising ally for help. Determined to crack the identity of The Thinker, Harry (Tom Cavanagh) enlists Cisco’s (Carlos Valdes) help to summon the ultimate think tank: “The Council of Wells’,” a roundtable of the brightest Harrison Wells’ from various Earths. Brent Crowell directed the episode written by Jonathan Butler & Gabriel Garza (#406). Original airdate 11/14/2017.